Hello everyone. We’re on the countdown to New Zealand Babywearing Week (10 – 16 October 2011) and are looking forward to celebrating with you. Over the next few months we’ll be offering giveaways from some of our sponsors. The next giveaway will be drawn once we reach 300 page members over on the New Zealand Babywearing Week facebook page. Our 300 liker giveaway sponsor is Rockin’ Green New Zealand – two lucky ‘New Zealand Babywearing Week Facebook page’ members will be randomly drawn to take home a 1.3kg bag of Rockin’ Green Classic Rock laundry powder (RRP$22.80) in their choice of scent. (Open to NZ residents only). 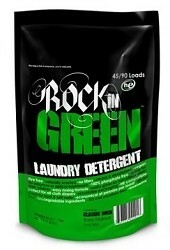 Rockin Green is an eco friendly, gentle washing powder which is taking New Zealand by storm. New Zealand families think Rockin’ Green rocks!! This classic formula is great for cloth nappies and regular clothes. So use it on everything! This formula is designed for those with middle of the road water, not too soft and not too hard. When in doubt start with classic rock! Available in several yummy fragrances and also unscented! Which would you choose? Leave a comment under this post to let us know which Rockin’ Green Classic Rock fragrance you will choose if you win. This entry was posted in Giveaways, New Zealand Babywearing Week and tagged giveaway, New Zealand Babywearing Week, NZ Babywearing Week, rockin' green nz. Bookmark the permalink. The link to the Rockin Green NZ Facebook page is wonky 🙂 We’re using Bare Naked Babies here and loving it but I’d also love to try Rage Against The Raspberries! Haven’t yet tried any of your products, but I want to now 🙂 Earth, Wind and Orchids sounds lovely, I would definitely go for that if I won! Haven’t tried any yet, all sound delicious but I think that first I’d go for Earth, Wind and Orchids to try. Never tried it before and after all the wonderful things I’ve heard about it I’d love to try it with my son having sensitive skin its hard finding something that doesn’t give him a rash!!! I’d love to try Smashing Watermelons! I would really like to try the Earth, Wind and Orchids please! Rage against the Raspberries sounds devine! My goodness they all sound mouthwatering! I think we’d definitely go with Lavender Mint Revival…Yum!!! I think Earth, Wind and Orchids sounds amazing, would love to win it! Earth, Wind and Orchids sounds so nice!! !